The Alpinestars Tech 7s are motocross boots for kids which are designed for the most demanding riders. It offers new levels of comfort, protection and flexibility. Check out the current range of Tech 7s boots below. In the Alpinestars Tech 7s is a pivot system that lets young riders experience excellent freedom of movement. Being able to move smoothly is important for a motocross racer to race quickly and in a controlled manner. Thanks to the innovative construction of materials, the tech 7s has a low weight and great flexibility. The flexibility is designed to be limited to a certain point. When that point is reached during a crash, the forces will be distributed and absorbed by the kids motocross boots. The soles are provided with a rubber grip pattern, this increases control over the dirtbike. 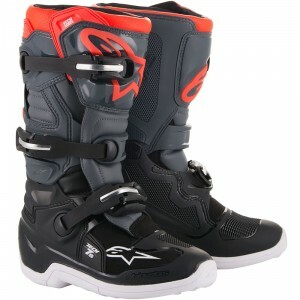 A complete overview of all technical characteristic is shown in the description of the Alpinestars Tech 7s motocross boots for children. 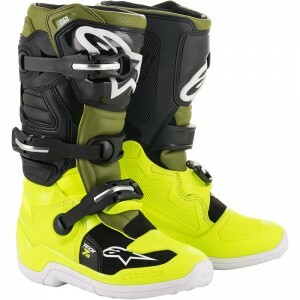 Alpinestars releases new colors regularly. Every year around the summer the new collection releases. 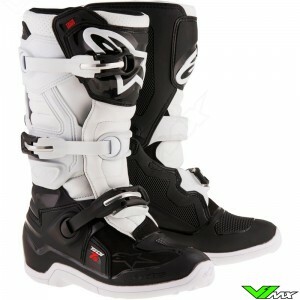 During this time new kids mx gear will also be released which fit together with the new motocross boots. In addition, occasionally new limited edition boots will be available. The limited editions are available in limited quantities, so be quick! 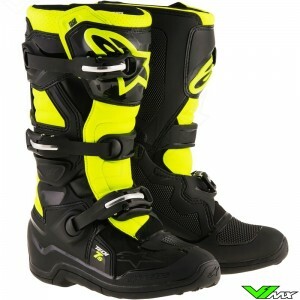 Do you have a question about the purchase of a new pair of Alpinestars kids motocross boots? V1mx is ready to answer your questions and give you advise on the wide range of motocross gear for children. Simply contact us by asking your question in the chat or send us an email.